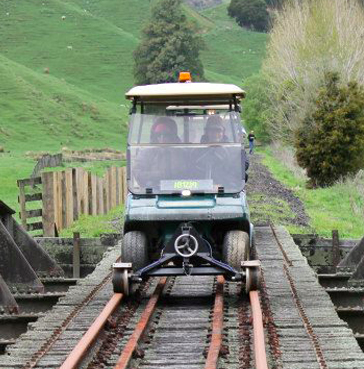 Enjoy a unique experience exploring rural New Zealand on board a rail cart, cleverly adapted to be self-driven along the tracks of the Forgotten World railway. This is a full-day adventure where you travel along decommissioned railway lines, through tunnels, over bridges, rivers and to townships that time forgot, whilst experiencing the most peaceful rural scenery. The journey wouldn't be complete without lunch at the iconic Whangamomona Hotel, and to top off this special rural adventure, you will experience unique country hospitality for dinner in a woolshed on an east Taranaki farm on the way back to New Plymouth.